Thugs of Hindostan is a joyless slog in the guise of a movie. Not every film needs to be uplifting, inspiring, or even fun. But watching a movie shouldn’t feel like you’re serving a jail term either. It’s a real shame because Thugs seemed to have all the ingredients for a swashbuckling adventure. There’s a small bunch of rebels taking down the Goliath-like villain, there’s thrilling action on the high seas, a clutch of decent songs, and of course, the casting of two stalwarts – Amitabh Bachchan and Aamir Khan – together on screen for the first time. The problem is that it’s all held together by a moth-eaten script from some 70s vault. This is trite, outdated plotting; a revenge saga that never lifts off the ground. Set in the 18th century, Thugs is about a gang of rebels, led by the heroic Khudabaksh (Amitabh Bachchan), trying to win back their kingdom of Raunakpur from the East India Company. Khudabaksh and his army go by the name Azad, which means the word is bandied about dozens of times to milk the patriotism angle. Khudabaksh is also the guardian to the heiress of the Raunakpur throne, Princess Safira (Fatima Sana Shaikh), who is tormented by the brutal way her family was killed by ruthless British officer Clive (Lloyd Owen). Frankly we’re equally tormented by the way Clive and the other British officers murder the Hindi dialogues. For some reason they insist on speaking in mangled Hindi even among themselves, instead of switching to English. Into this mix, writer-director Vijay Krishna Acharya throws the film’s most colourful character, Firangi Mallah (Aamir Khan). He’s a duplicitous double-crossing rogue; a charming opportunist who cons people for a living. The British hire him to infiltrate the rebel group, and we’re never quite sure which side he’s on. In a corny scene we watch as the righteous Khudabaksh rubs off on Firangi while convincing him to till a barren land with him, planting seeds of hope. The film in fact is riddled with corny bits involving protection bracelets, poisonous laddoos, and a falcon (perhaps loaned from a Sooraj Barjatya set) that not only appeals to a character to make the right decision, but on another occasion, wisely drops the bracelet into the correct hands. All of this unfolds over an exhausting 2 hours and 44 minutes. It’s a good thing the action scenes are nicely mounted and executed, especially the ones in which rival ships go to war on the sea. An early sequence in which a Trojan horse is smuggled onto a ship is especially impressive. But for the most part Thugs of Hindostan is a humourless, solemn affair. Barring Firangi, the other characters are a sullen lot that sport long faces as if they were fed sour lemons all their life. Fatima Sana Shaikh is blank in the emotional scenes, but fares better when she’s shooting arrows or landing blows in the action portions. Katrina Kaif, who plays a dancer named Surayya, shows up for precisely three inconsequential scenes. Her chief job here is to writhe around on the floor for two songs. Amitabh Bachchan, his expressions hidden under a mound of facial hair and long tresses, performs the action bits convincingly, but is barely challenged in a role that doesn’t require him to utter his first words until nearly an hour into the film. It’s only Aamir Khan who appears to be having any fun around here. 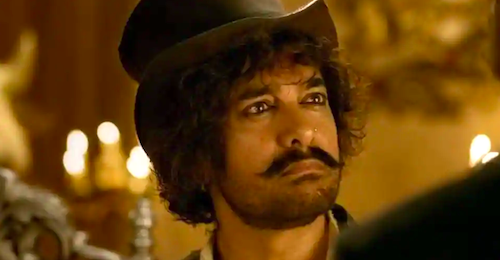 His constantly jabbering Firangi gets the best lines in the film, and the actor’s inherent charm lifts this anti-hero off the page, although after Lagaan and Mangal Pandey it’s getting a little tiring watching him go up against the British again. The biggest disappointment, without question, is the wasted opportunity of a plot that squanders the possible chemistry between Bachchan and Khan. For that we’ll just have to wait until a better film comes along. I’m going with a generous two out of five for Thugs of Hindostan. It doffs its hat to everything from Kranti to Pirates of the Caribbean, but this ship hits the iceberg early on in its journey.